A Fox Business Channel host says America’s unions are “the antithesis of freedom.” The National Labor Relations Act of 1935, signed by President Franklin Roosevelt, was designed “to protect the rights of employees and employers, to encourage collective bargaining, and to curtail certain private sector labor and management practices.” For years, conservative and Republican candidates and organizations have fought against unions’ rights to bargain collectively, in part because labor unions are a critical element of the center-left “progressive” coalition in American politics. [Media Matters, 9/7/2010; Board, 2011] A regular segment on Fox News is titled, “Unions: Can America Afford Them?” [Fox News, 2011] Fox News host Glenn Beck often calls union workers “thugs” and/or “enforcers.” [Media Matters, 9/7/2010] A Fox Business Channel (FBC) commentator calls labor unions “the antithesis of freedom,” and says that while “fortunately” private sector unions “have retreated,” public sector unions are still a “problem.” Stuart Varney, a guest of Andrew Napolitano on Freedom Watch and host of Varney and Company on FBC, says that unions have been “a disaster for the British economy,” and continues: “They are the antithesis of freedom. They impose rigid workplace rules that have no place in a modern economy.” Later, Varney says: “Fortunately, unions have retreated in the private sector. It is in the public sector where they rule, and that is the nature of some of our problems.” He adds that “taxpayers” and “the concept of freedom and liberty” “suffer” from the existence of unions. 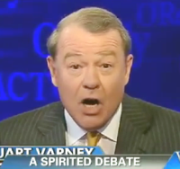 [Media Matters, 9/4/2010; Media Matters, 9/7/2010] The same day, on his own show, Varney accuses a union advocate of “siding” with America’s “enemies” (see September 4, 2010).